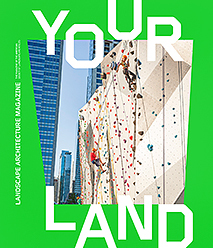 Landscape Architecture Magazine (LAM), the monthly magazine of the American Society of Landscape Architects (ASLA), has just launched Your Land, a special print supplement for young readers. Your Land is a one-time publication produced in response to a rising interest among ASLA members to introduce the profession of landscape architecture to students from grade school through high school. The supplement is available with the April issue of LAM, just in time to help celebrate World Landscape Architecture Month, which begins April 1. Your Land provides snapshots of the aims and means of landscape architecture, and primers on several intriguing project types. Your Land is available in bulk for classroom or group uses. The publication is free; ASLA asks only that recipients cover shipping costs and report on how their use of the supplement helped introduce landscape architecture to young people. For bulk copies, please complete the forms on this webpage and mail to discover@asla.org. Founded in 1910, Landscape Architecture Magazine (LAM) is the monthly magazine of the American Society of Landscape Architects. It is the magazine of record for the landscape architecture profession in North America, reaching more than 60,000 readers.